Fat Bruce Lee and I had heard from a couple of sources that MVP's was the burger to try when in Long Beach, CA, and we had cause to be in Long Beach, CA. MVP's was also a Yelp darling. Parking was free on the street. 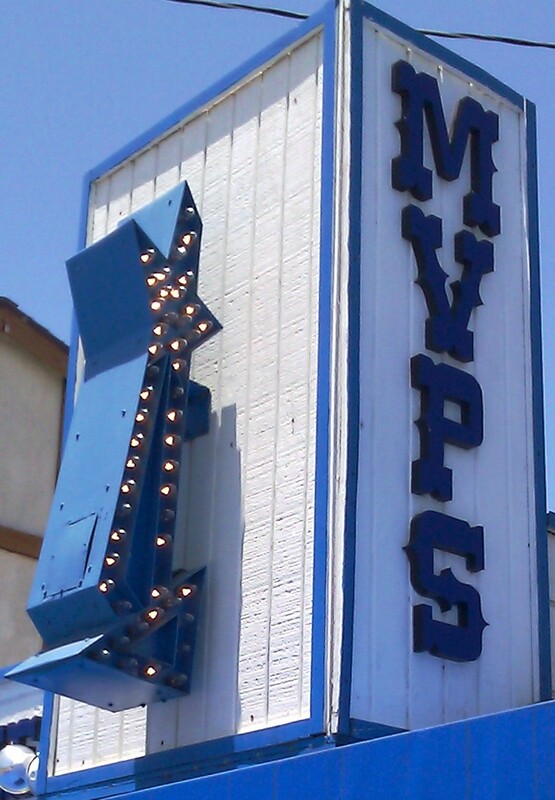 MVP's was another of those classic, California, burger stands. MVP's was actually in the middle of the front yard of one of the homes that lined the street. We stepped up to the window, ordered a couple of meals--cash only, and waited about 15 minutes for our cheeseburgers. 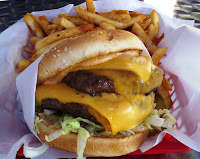 At MVP's the cheeseburger combo (1/3 pound cheeseburger, large beverage, and an order of fries) was 7 bucks. The double cheeseburger was a dollar more, and Fat Bruce Lee has always been a sucker for a deal, so he ordered the 2/3 pound double cheeseburger combo. The Beef: This was 80:20 Chuck. The beef was moderately juicy, and it was not greasy. It was beefy, and it had just a touch of aged flavor and scent. The beef was completely fine. It was not exceptional in any aspect. The beef provided a resilient bite without being chewy. The Seasoning: MVP's hit the burgers with just the right amount of salt and pepper to carry the patty beyond the single note of beef from the Chuck. The Sear: They applied a reasonable sear to the unevenly flat patties. The sear was dark and crisp on the portions of the patty, which made contact with the hot griddle. The sear was satisfying. The Preparation: The 1/3 pound, hand-formed, irregular, flat patties were created with moderate pressure. The burgers were cooked to a juicy enough Well-Done on a hot flat-top. The cooking process rendered enough of the fat out of the beef to avoid gut bomb status. The Cheese: MVP's did not skimp on the American cheese. Every patty received two slices. That means that Fat Bruce Lee had four on his double cheeseburger. That was 400 calories from just the cheese. The cheese melted over the burgers as the heat from the patty worked its way through the dish. 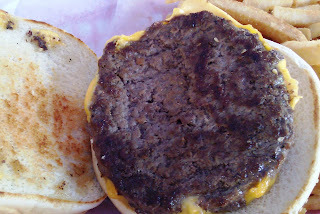 For the single cheeseburger, 2 slices made sense, since the Chuck did not provide any complexity in terms of flavor. The American cheese filled in with savory, mineral, and umami notes. Fat Bruce Lee found the 4 slices all at once was too much even for him. The Bun: The bun was a competent, standard, white, seeded, toasted, un-buttered, hamburger bun. The bun was simply a means to convey beef and cheese to mouth. It was generally invisible on the palate, and the texture was pleasantly chewy and soft. The Meat to Bun Ratio: This was a little skewed toward the bun. The same bun was used for both the single and double burgers, and the ratio seemed perfect for the gluttonous, over-sized portion. The Fries: The fries were the par-cooked and frozen in a bag variety. MVP's provided at least a full pound of fries with their combo meals. They offered them salted or Cajun seasoned. Either way, they applied just the right amount of seasoning to the well-browned, crisp fries. They were just fine. The Value: No one was able to finish their food. 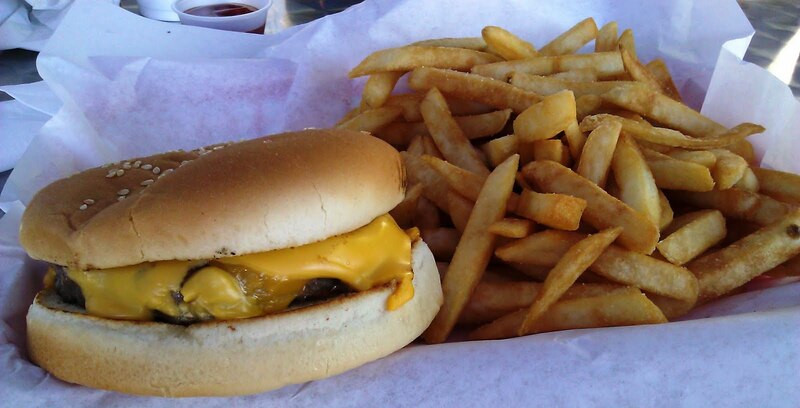 Most of the tasty fries went uneaten, and Fat Bruce Lee relented at the 60% mark on his double cheeseburger. The value was good. While MVP's did not serve up an amazing burger, they did serve up a fine burger for a fair price. The extra cheese on every burger was a nice touch. I plan on taking Happy Meal (my youngster) there the next time that we visit The Aquarium of the Pacific in Long Beach. Burger Review : A good burger at a very good price was enjoyed at MVP's Grill and Patio.